Hello! Are you ready for your Mystery Date? You will never guess where your going! A Picnic, a Formal Dance, Skating, the Beach! you will just have to play the game to find out! You will never know where it is for sure until you open the door! 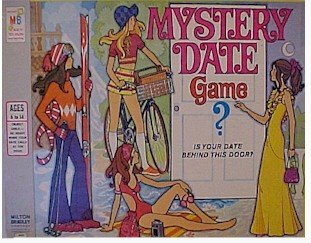 I saw a revamped version of the board game, Mystery Date in Target over the weekend. Anyone around my age can remember the 70s-80s version above. Oh, how I wanted the brown-haired stud to take me to the formal dance. Pluuueeeezzze be behind the door! Today’s RE appointment felt A LOT like a mystery date. How strange it was to sit down with a huge binder and pick your future child’s genetic donor. Strange indeed. I admit, I was a bit nervous. The Donor Coordinator (she was so cute and perky) gave me the instructions on how the binder was set up. Then she brought me a drink, a notepad, and pen. Wow, I thought… fast service. So it was just me and about 40 in-house profiles. I was hoping to find at least a few in-house donors, to cut down on the travel costs and such. And I was not disappointed. Since I did not restrict myself on a lot of the visual characteristics, I narrowed down to 6 profiles within about 90 minutes. I did have some ‘deal breakers’, however. Not going to go into serious detail here, but there was one profile I loved, but she had a specific medical concern in her family that was my deal breaker. That one, sadly, went back into the binder. I was bowled over by some of the meticulous details provided. At the end of each packet it was as if I had a visual drawing in my head of each donor. One particular packet caught my eye. She wrote it as if I wrote it myself. She was almost me, but 15 years younger, and with brown eyes. I didn’t think it was possible. Nurse V called two of the donors for me with regards to the questions I had. Both donors provided answers within 10 minutes. It was as if they were waiting by the phone. In the end, I brought home four profiles. Each one very different in their own way, and all having special reasons why I chose them. This is finally real to me now. I’m about to open the door and go to The Dance. « How much fun can you handle? What an interesting time it is for you. I hope that you are able to find someone that you feel comfortable with and that you have success as quickly as possible. I admire your strength to continue down this path when it has been so hard. How exciting! It all sounds very promising. Good luck narrowing it down to THE ONE. You probably weren’t reading me back then, but your mention of getting ready to go to the dance reminded me of this post of mine: http://smartone.typepad.com/smartone/2008/03/how-do-you-hold.html. I have lots of hope for you. Tons of it. I’m crazy excited for you. That’s way better than getting to open the Mystery Date door. Wow Shelli, That’s HUGE progress. And the whole donor selection process is like dating. OMG when do you think you could cycle. I guess it depends upon the donor and when they’d be ready.